We already saw teasers from Asus and MSI regarding their upcoming custom cooled graphics cards based around the Nvidia GeForce GTX 1080 Ti. They will shortly be launching the ROG Strix GeForce GTX 1080 Ti OC edition and the GeForce GTX 1080 Ti Gaming X, respectively. Just ahead of the weekend both EVGA and Inno3D dropped HEXUS a line to whet our appetites a little more for their third party designs. All we have from EVGA is the product name, and a couple of pictures. EVGA's upcoming card is called the GeForce GTX 1080 Ti FTW3. As you can see it’s a triple fan design and uses EVGA's rather new iCX technology. If you somehow missed Tarinder's deep dive into EVGA iCX cooling about a month ago, then have a look here: EVGA launches iCX cooling on premium GeForce cards. The principle behind iCX is that there is a custom MCU and a multitude of sensors placed around these graphics cards, these can help intelligently direct asynchronous fan control as the 'Precision XOC' utility directs cooling resources better. On modern GeForce cards the GPU isn't always going to be the hottest component and the iCX seems to deal with this proposition better than ACX could. Inno3D are offering not just triple fan but quad fan GeForce GTX 1080 Ti designs. As you might expect these employ the iChiLL X3 and X4 coolers we have seen previously. HEXUS has reviewed iChill X3 cards such as the Inno3D GeForce GTX 1070 iChiLL X3, and the Inno3D GeForce GTX 1080 iChiLL X3 in recent months, if you want to see how iChill coolers perform. "I believe gamers will love our new iChiLL gaming GPUs." said Ken Wong, Product Manager at INNO3D. 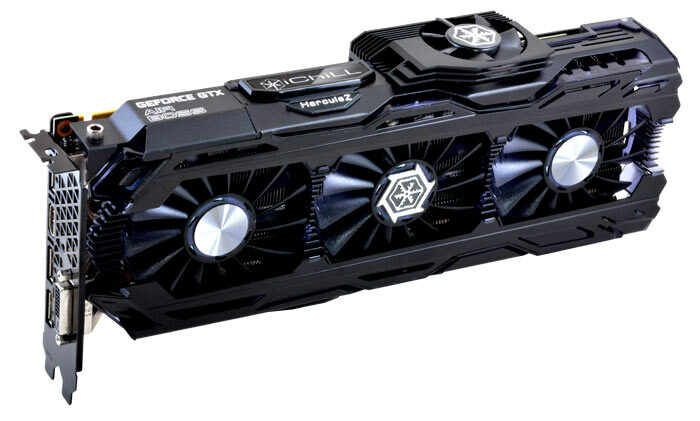 "The entire series of GeForce GTX 1080 Ti comes with extreme performance, and we have used the highest quality components worthy of such a product. The iChiLL cooling solution makes the INNO3D custom-built graphics card to be the perfect weapon for every gamer." Nvidia claims that its new GTX 1080 Ti outperforms its previous flagship consumer gaming card by approx 35 per cent. Check out the re-cap video from Nvidia's GDC presence below if you missed the news last week.